From Chef Jose Andres, A Family Favorite For $10 NPR's "How Low Can You Go" family supper challenge asks celebrity chefs to cook a meal for four for less than $10. Jose Andres, who owns several Washington, D.C., restaurants and hosts the Made In Spain PBS show, makes a family favorite: Moorish-style chickpea and spinach stew. For the NPR challenge, celebrity chef Jose Andres cooked a favorite family recipe: Moorish-style chickpea and spinach stew. By his calculation, Andres says he spent $9.71 for all the ingredients. 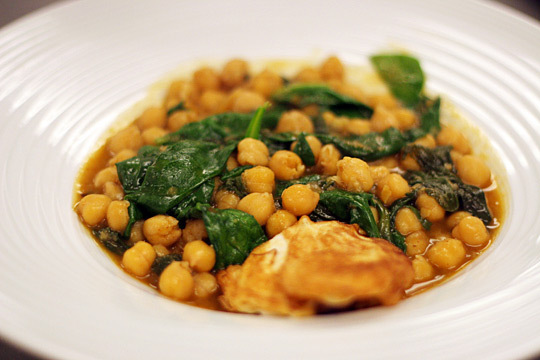 Get the recipe for Moorish-style chickpea and spinach stew. 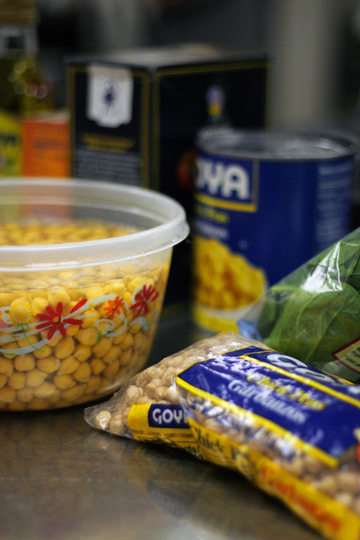 Chickpeas can be found in a can, but Andres suggests using dried chickpeas for his recipe because they're less expensive and have less salt. But they have to be soaked overnight in water and a pinch of baking soda to soften them. 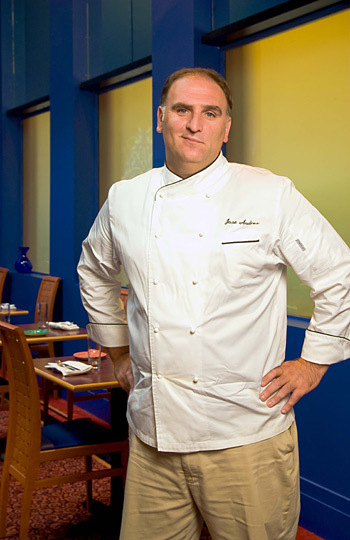 Celebrity chef Jose Andres presides over a culinary realm that includes a collection of acclaimed restaurants in Washington, D.C. and Los Angeles, the Made in Spain PBS cooking show and several popular cookbooks. For his meal, Andres suggested that he cook at DC Central Kitchen instead of doing a show-and-tell at one of his posh restaurants. He's a frequent volunteer at the community kitchen, which feeds the hungry while providing job training in the food-service industry. 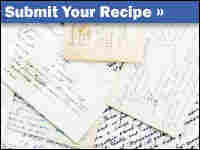 Andres decided to prepare a favorite family recipe — a dish that his wife, Patricia, made for him soon after they were married. 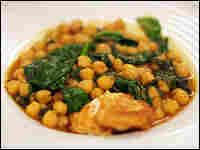 It's a Moorish-style chickpea and spinach stew, or, in Spanish, garbanzos con espinacas. "This is probably one of the most expensive dishes that she made for me ever, not because of the ingredients, but because I think she called her mother, and I think she was on the phone almost through the entire process of making these chickpeas with spinach," Andres tells NPR's Michele Norris. "I remember how good it was, how affordable it was. But the telephone bill is something I will remember forever." The dish is the kind of simple one-pot meal that reminds Andres of his own childhood in Spain. "I remember that at the beginning of the month, the kind of menus my mom and father would prepare for us would have fish, chicken. But at the end of the month — because my father would be waiting for paycheck — the refrigerator would get empty," he says. "I remember that without a lot of food left, some of the best meals happened right there." An empty refrigerator led to an abundance of creativity. 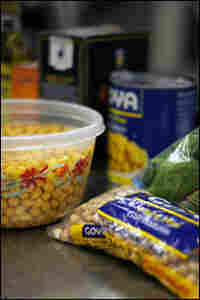 The main ingredient of Andreas' meal, chickpeas, can be found in a can, but the chef suggests using dried chickpeas. They're less expensive, and they have less salt and none of that goopy liquid you find in the can. They take more work, though. They're like little pieces of gravel until you soak them overnight in water and a pinch of baking soda. After that, rinse the softened chickpeas and boil them for about an hour in a heavy pot with just enough water to cover the ingredients. How do you know when they're done? Andres says you just have to listen. "You're going to look at them, talk to them," he says. "What if you're not fluent? I'm talking to them, touching them, and with a little pressure in your fingers, you see they are very soft thing. The chickpeas is telling me, 'I am ready.' I'm sorry you can't hear them yet, but by the end of the day, you will be fluent." Talking to the food is just as important as tasting it — and the taste should be punctuated with a little kick, Andreas says. As for the bill, how low did he really go? By his calculation, Andres says he spent a total of $9.71 on all the ingredients. This is one of the first dishes Jose Andres' wife, Patricia, cooked for him, soon after they were married. The day before you cook, soak the chickpeas in cold water with a pinch of bicarbonate of soda. The next day, drain and rinse the chickpeas. In a big saucepan, combine the chickpeas with 2 1/2 quarts of water. Bring to a boil, reduce the heat to low and simmer for two hours, until the chickpeas are tender. Every 10 minutes or so, add 1/2 cup of cold water to slow down the simmering. By the end, the water should have reduced so it is barely covering the chickpeas. Turn off the heat and let sit. In a small saute pan over medium to low heat, brown the garlic in 1/4 cup of the olive oil. When the garlic is browned, after about 3 minutes, remove from the pan and set aside. Add the bread and brown on both sides, about one minute each side. Remove the bread and set aside. Remove the pan from the heat and allow to cool for a few minutes. Add the pimenton and saffron to the saute pan, and the sherry vinegar immediately afterward to prevent the pimenton from burning. In a mortar, smash the reserved garlic and the browned bread to make a very thick paste. Bring the chickpeas back to a low boil and add the spinach. Simmer for 5 minutes. Add the pimenton mixture along with the garlic and bread paste, to create a thick, stewy sauce. Simmer for another 5 minutes. Season with salt and pepper to taste, and serve immediately. When the chickpeas are soft and cooked, only about one finger's depth of water should remain in the bottom of the pan. If there is more, remove some water from the pan before adding the rest of the ingredients. By the way, if you're in a rush and want to make a successful dish without cooking for two or three hours, you can use good quality chickpeas from a can or jar. Recipe adapted from Tapas: A Taste of Spain in America by Jose Andres, published by Clarkson Potter.